How do you establish a safe, orderly environment when a construction project impacts local road conditions? The solution is a sound temporary traffic control strategy. Roadway Construction Service (RCS) has provided these solutions for years. From detour signs to hawk-eyed flaggers, our depth of resources ensures the highest level of temporary construction zone traffic control. For RCS, every temporary construction zone is unique challenge. To respond effectively, crews must be ready to adapt. Quick reflexes and penetrating insight are must. Complicating matters, conditions can change in a split-second. Among the variables crews must consider are road type, geometrics, vertical and horizontal alignment, and volume of pedestrian traffic. In every case, the RCS team skillfully responds to these variables, establishing an unsurpassed level of safety and efficiency for temporary traffic control. The acclaimed adaptability of RCS begins early-on with careful planning. Leveraging a wealth of expertise and experience, our team consistently develops rock-solid temporary traffic control plans. Covering all possible conditions and contingencies, these plans can take a variety of forms. The most sophisticated of these forms is a highly-detailed analysis of the project site and surrounding environment. An important adjunct of the planning phase is the acquisition of temporary traffic control permits. For the vast majority of construction companies, the permitting process is a monumental time and money drain. Facing these companies is a snarl of red tape that can eat up hours and even days of precious time. RCS, however, has the resources to cut through the frequently-encountered tangle of red tape. Once we’re involved with the temporary traffic control permitting process, you can sit back and relax. But don’t get too comfortable. We’ll have your project ready to go in record time. That’s because RCS has the experience and knowledge to navigate the often-complex permitting terrain. We know which ropes to climb, which codes to target, and which decision-makers to contact. A good example of this permitting prowess is our handling of temporary construction zone encroachment permits. These authorizations are mandatory when a construction company is working on a public right of way, such as a sidewalk or roadway. By securing the necessary permits, RCS enables your company to meet stringent municipal codes. These codes, in turn, ensure a construction zone is protected by the highest possible safety standards. Once the RCS team is on the job, we deploy all resources for optimum results. This includes setting up temporary traffic control barricades. Portable and convenient, these devices provide an important layer of protection for construction personnel, pedestrians, motorists, and our ATSSA certified crews. Construction zone road barriers include channelizer drums to warn drivers of unexpected changes, A-Cade barricades, crosswalk barricades, and K-rail. 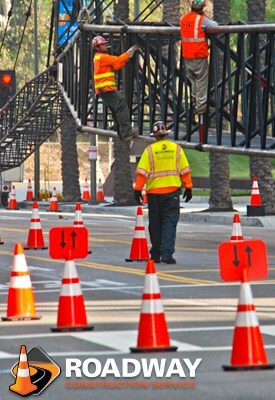 By providing busy municipalities with expert temporary traffic control solutions, RCS plays a huge role in the protection of California motorists, pedestrians, and work crews. To learn more about our services, contact RCS today. You’ll discover why we’re the go-to traffic control service in Los Angeles, Orange County, and all of Southern California.